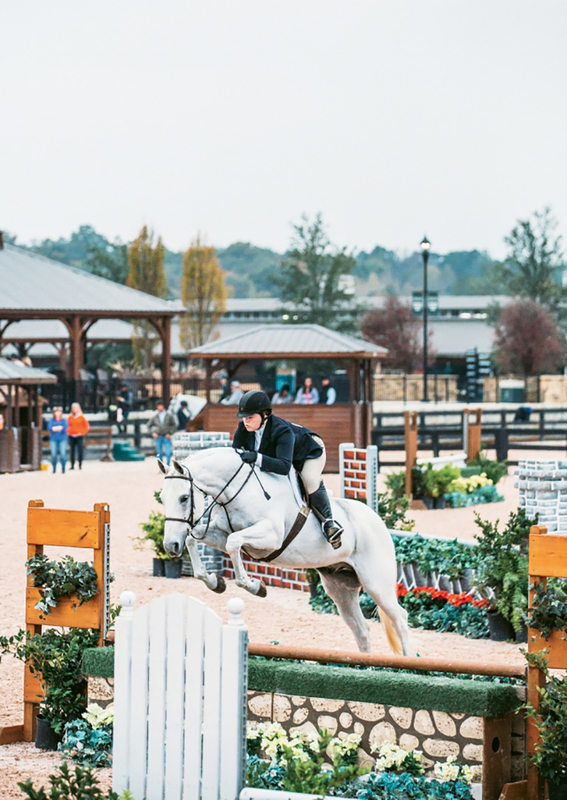 On a dirt ring at the Tryon International Equestrian Center, a rider wearing bright white pants, shiny black boots, and a formal black riding coat sits elegantly in the saddle and, with poise and military precision, guides a horse through a series of crisp maneuvers. Rider and mount are competing in an event known as dressage, one of the oldest equestrian competitions, which traces its roots back to European battlefields several centuries ago. The scene is but one of many spectator events at TIEC, a newly minted equestrian center in Polk County just east of Columbus. The sprawling, 1,400-acre venture features a 5,000-capacity stadium, 850 permanent stalls, and 10 riding arenas surrounded by shops, restaurants, and the future site of a resort hotel and spa. The $200 million complex is the creation of former tech entrepreneur Mark Bellissimo, who, along with his partners, set out to create a world-class equine megaplex that would attract the best riders from around the world. And while a high-end horse-riding mecca may seem an unlikely fit in the hardscrabble clay foothills of the western Piedmont, Bellissimo is intent on taking the niche sport with an aristocratic image to folks who may not know a bit from a bridle. Though he’s acquired a fortune, Bellissimo, a Boston native, comes from middle-class roots. So when his daughters took up the sport and began spending weekends at events, he was troubled by the glaring lack of possibilities for kids from humble origins. “Equestrian sport is considered elitist, but horses are an important part of American culture,” says Bellissimo. “There’s broad interest in experiencing the lifestyle, but it just hasn’t been accessible.” So whether it’s enjoying the center’s carousel or watching an Olympic-caliber rider in a Saturday night grand prix competition, he’s hoping to appeal to anyone who has an interest. Molly Oakman, the center’s community relations manager, can relate to both the charm of the equine world and the hard knocks of the textile belt. The Rutherford County native grew up riding horses and has two young daughters that she describes as pony fanatics. She’s also seen the western Piedmont, once a thriving manufacturing hub, hit economic rock bottom. So when Oakman heard about the possibility of a world-class equestrian center in her backyard, she was elated. A real estate agent at the time, Oakman knew that someone had quietly purchased the failed White Oak Golf & Equestrian Community in early 2013. That person, of course, was Bellissimo. After a visit to the then-empty site, he sketched his vision for the project on napkins and scraps of paper during a plane ride home. Nearly everything was there: a large footprint, a central location on the east coast, a strong heritage in equine sports, and a supportive community. While Oakman was thrilled about the concept, a mega-investment that could transform the region’s economy sounded at first like a fairy tale. Both Polk and Rutherford counties were reeling from the decline of the furniture and textile industries and some of the highest jobless rates in the state—reaching nearly 20 percent in the last economic downturn. The loss of those jobs had a domino effect, knocking out service and retail jobs, too. “I had seen the community get excited about developments in the area before,” says Oakman. “There were lots of hopes and dreams and promises that didn’t amount to much.” Still, she thought there might be something different about Bellissimo and his partners. For one, she says, his name was already the gold standard in equestrian sport: Prior to conceiving TIEC, he’d launched marquee equine events including the Winter Equestrian Festival in Wellington, Florida, and the Central Park Horse Show in New York City. From an equestrian point of view, and as a former rider, Oakman felt that the center was a perfect match for the long tradition of horseback riding in Polk County. The Tryon Riding and Hunt Club was established in 1925, and the region is regarded as the birthplace of steeplechase racing. It even hosted the 1956 and 1960 U.S. Olympic team trials. That tradition has left a legacy that includes dozens of miles of horse trails, a community of horse lovers, and a knowledge base that you can’t find in just any rural region of the United States. Knowing the county’s rich equestrian history, Oakman became a self-appointed cheerleader for the new center. While there were skeptics initially, the quick work in building the facility made most folks believers, she says. “It’s a saving grace for so many reasons,” says Oakman. “The community really needed this.” Not only will the center employ 300 people at its peak, but the economic impact has multiplied to construction jobs and new enterprises in the surrounding communities. And, hopefully, TIEC will build a growing equestrian fan base, too, says Bellissimo. “While we viewed this as a business opportunity, we were equally inspired by the prospect of trying to re-energize a community and broaden the appeal of the sport,” he says. The grand opening, in June 2015, was a promising start to the venture, with roughly 10,000 attendees, including Governor Pat McCrory and broadcasters from NBC Sports Network. While there were plenty of experts in the crowd, many were likely newcomers to the parlance of equine sport. To overcome that, Bellissimo has incorporated lessons learned from attending his daughter’s equestrian events: They were often muddy and lacked sufficient places to sit, and finding a decent cup of coffee or meal was simply out of the question. TIEC offers a comparatively lavish experience for visitors. Tammy Martell, the owner of Bed and Barn Farms in nearby Forest City, says it’s among the best laid out facilities that she’s seen, with Jumbotron screens making all the action especially viewable. “It’s very spectator friendly. There’s no bad seat there.” And there’s plenty to watch, with horses dashing and gliding over obstacles in a sport that’s been part of the Olympic games for more than a century. The center features horse shows from the spring to the fall, Wednesdays through Sundays. And perhaps best of all, Martell notes, there’s no price of admission. Each show has three main divisions: hunter, jumper, and equitation. In each event, riders are judged on a combination of speed, accuracy, and form. The grand finale of the multiday shows is the Grand Prix jumping competition, one of three Olympic equestrian sports, along with dressage (the performance of choreographed movements) and eventing (a combination of dressage, show jumping, and cross-country jumping). It’s held during the center’s Saturday Night Lights series, which also features an array of family friendly events, food, and live music. “Where else can you watch a major sports event and sit and be entertained for free?” says Martell. “There’s nothing like watching the elegance of a horse and rider soar over jumps. I think it’s one of the most beautiful things you can watch.” And not only will novice horse watchers figure out the difference between a cantor and a gallop, it’s possible to get up close to the magnificent animals that are the soul of the sport that, for many, transcends equine’s courtly image.